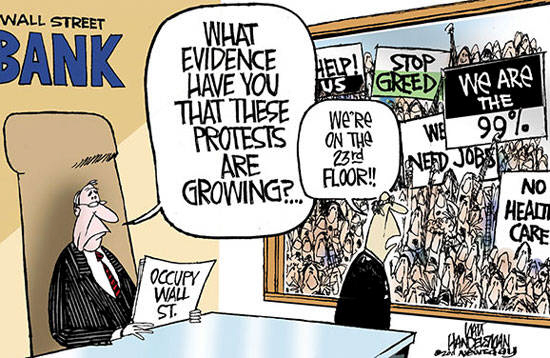 One common criticism of the Occupy movement was that it lacked focus and leadership. This tends to be appropriate and necessary in the early days of any social movement. However, now’s the time for professionals to step in who know how to mobilize people, resources and media. The fact that unions, progressive political groups, human rights workers, eco-activists, and student groups are being trained and motivated by experienced and energized organizers is vital and unprecedented. This will draw a lot more attention to the growing gap between the richest one percent and the rest of us. 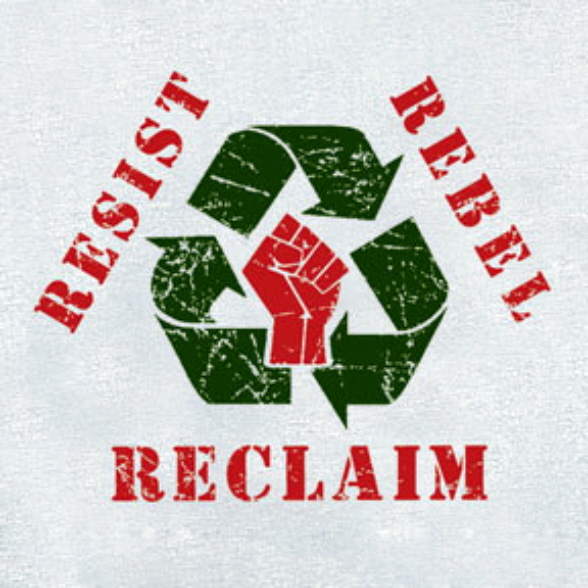 In my view, one of the most important contributions of 99% Spring will be to build a true sense of class consciousness among the diverse groups and individuals who are joining this broad-based and increasingly well-organized movement. To paraphrase Karl Marx, capitalism will only change when a critical mass of people realize and publicly acknowledge that we are all being exploited by the corporations and their government servants. We now see that many other people are in as bad or even worse shape than we are. Fortunately we also find out how much strength there is in numbers. Before turning this article over to information about the 99% Spring movement, I want to promote my personal pet protest project – ending the wasteful war on marijuana. 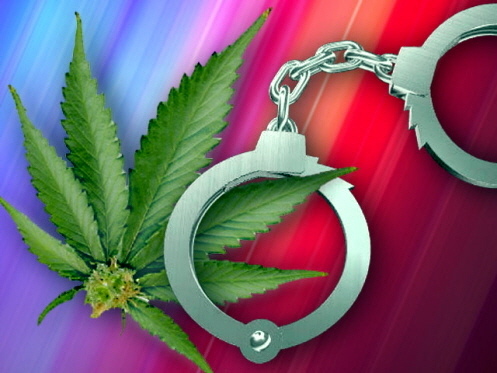 The drug war is unethical and ineffective – targeting poor, minority youth. 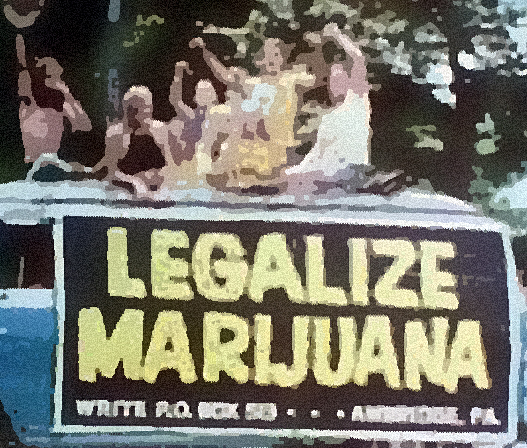 I have outlined an innovative and easy approach to protest the immoral drug war in my recent article entitled “Occupy 4:20 for Civil Disobedience and Building Community.” Another related article (“Medical Marijuana: President Obama Must Lead or Get Out of the Way! !”) details why we all need to pressure the Obama administration to end their hypocrisy and abuse of power that threatens state’s rights and millions of patients. Anyhow, this particular issue will certainly engage and impact young people, human rights advocates, and people of color. OK – enough of my soapbox. 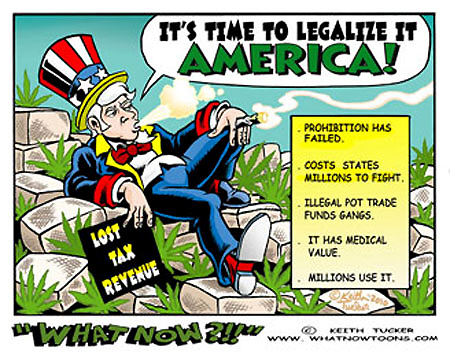 Get involved if you want to have fun, make friends, and help people through Cannabis activism. Now it’s time to learn all you could ever want to know about the 99% Spring movement – including how and why anyone can and should become involved. This section synthesizes information from their website. 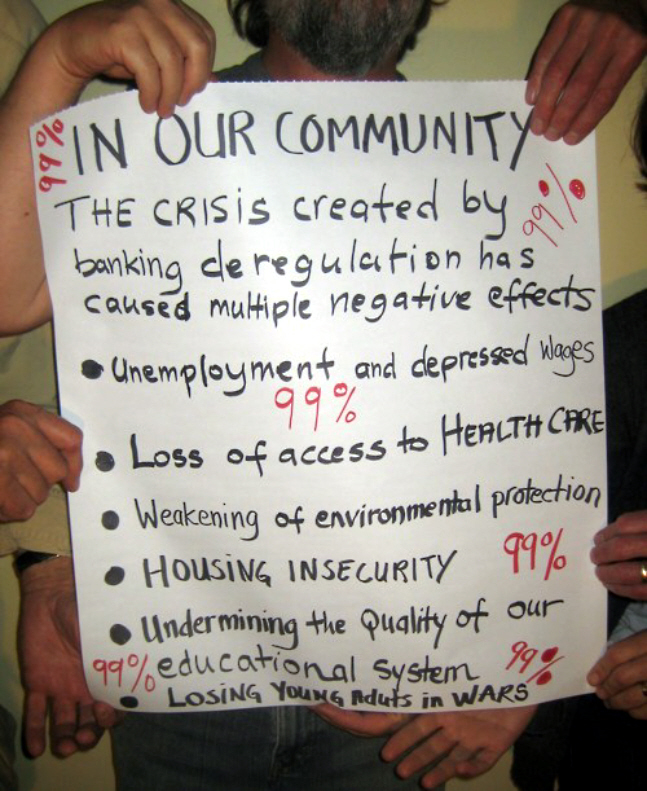 NOTE: The 99% Spring was launched with the following letter signed by over 40 movement leaders and organizations. Things should never have reached this point. Every day, the American Dream seems a little farther away. More of our grandparents are being thrown from their homes. Our mothers and fathers can’t retire because their pension funds tanked. Our brothers and sisters are burdened by student loan debt. For our children, budget cuts have resulted in crumbling schools, skyrocketing class sizes, and teachers being denied the supports they need to do their best. Our friends and family are being denied collective bargaining rights in their workplaces and are falling further and further behind. Our neighbors are being poisoned by pollution in our air and water. The numbers are staggering: in recent years, millions of jobs have been destroyed, homes foreclosed, and an unconscionable number of children live in poverty. And worst of all: this is no accident. It is a result of rampant greed—the deliberate manipulation of our democracy and our economy by a tiny minority in the 1%, by those who amass ever more wealth and power at our expense. We are at a crossroads as a country. We have a choice to make. Greater wealth for a few or opportunity for many. Tax breaks for the richest or a fair shot for the rest of us. A government that can be bought by the highest bidder, or a democracy that is truly of the people, by the people, and for the people. The choice is in our hands. This spring, we will act on that choice and rise up in the tradition of our forefathers and foremothers. We will not be complicit with the suffering in our families for another year. We will prepare ourselves for sustained non-violent direct action. We know great change is possible. We inherit a history of everyday people standing up for their own dignity, freedom, and self-determination, shaping our direction as a country. The seamstress in Alabama who launched a bus boycott. The farmers in New England and Virginia who imagined we could be a free nation. The workers in Flint, Michigan who occupied their plant to win collective bargaining rights. The farmworkers in California who liberated our fields. The women in New York who dreamed they could one day speak with equal voice. The mother who stood up in Love Canal to stop the poisoning of her community. And the students who risked their lives during Freedom Summer to register voters. 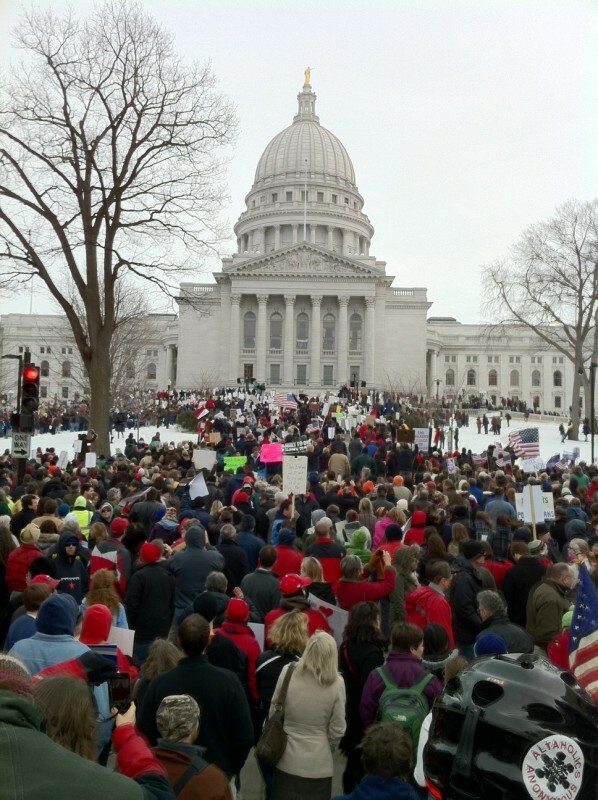 In the last year alone we watched the teachers and fire fighters of Wisconsin stand for the rights of workers. And we joined those who Occupied Wall Street, inspiring us to stand with the 99%. 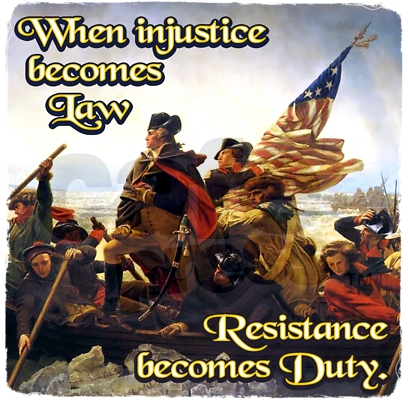 We will rise this spring, because we DO hold these truths to be self evident—that all men and women are created equal, that we are endowed by our Creator with certain unalienable rights, that among these are Life, Liberty and the Pursuit of Happiness. Will you rise with us? 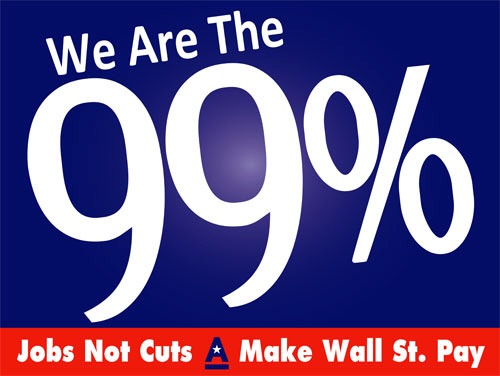 Can we count on you to join us April 9th to 15th to stand with the 99% for America? Q. 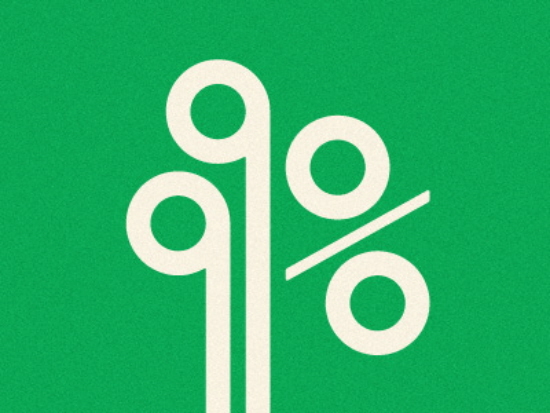 What is the 99% Spring? 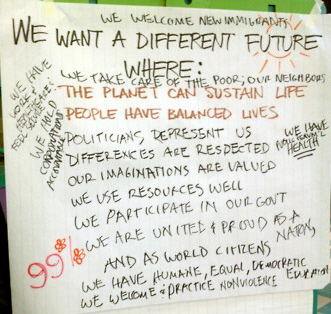 The 99% Spring is a massive initiative to train 100,000 people in nonviolent direct action and the principles of economic and social justice, and then direct those people to opportunities to take action in their own communities. Behind the project stands an unprecedented coming together of hundreds of groups, ranging from climate activists (like 350.org and Greenpeace) to direct action practitioners (like National People’s Action and Ruckus Society), worker advocates (like Jobs with Justice, National Domestic Workers Alliance, United Auto Workers and SEIU) and netroots organizations (like MoveOn.org and Color of Change). Q. Did I miss the 99% Spring trainings? Is it still possible to take part? Q. Where can I sign up for upcoming actions? What types of actions are happening? Q. What kind of actions can I post on your Actions Map? So long as you pledge that the action will be nonviolent in nature, there’s no built-in limit on what actions you can register on the community action site. Already people are pushing a number of big movement-wide moments. You can plan and recruit for your actions here. Q. Where can I see people’s reports from their 99% Spring trainings/actions? We have had so many reports from the training and the actions pouring in. You can find more reports from trainings and actions at our Tumblr blog, or by following the hashtag #99spring. Q. How was 99 Spring organized? Are some groups playing bigger roles than others? 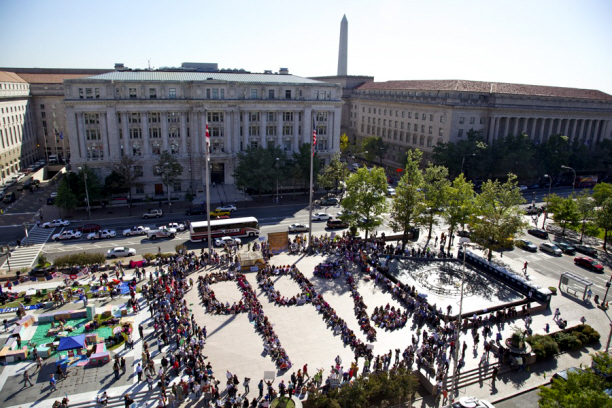 The 99% Spring is collaborative project that involves hundreds of organizations. It includes over 1,000 in-person trainings and tens of thousands of people are also being trained online. 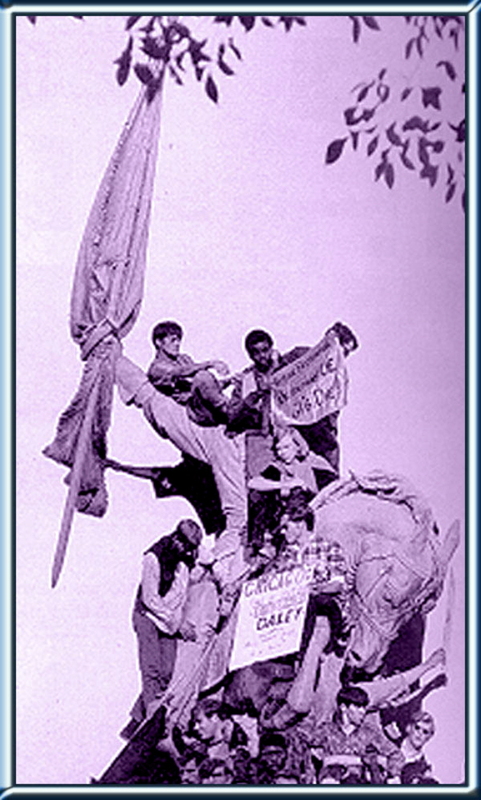 Different organizations have contributed to the 99% Spring in different ways, from dedicating staff and tools to help make this historic effort a success, to recruiting trainers, to turning out their members to attend. A diverse array of organizations and individuals are also organizing actions following the 99% Spring — You can find those actions on our Actions Map. Q. 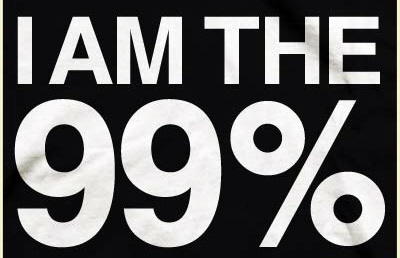 2012 is an election year — is the 99% Spring aimed at influencing elections? 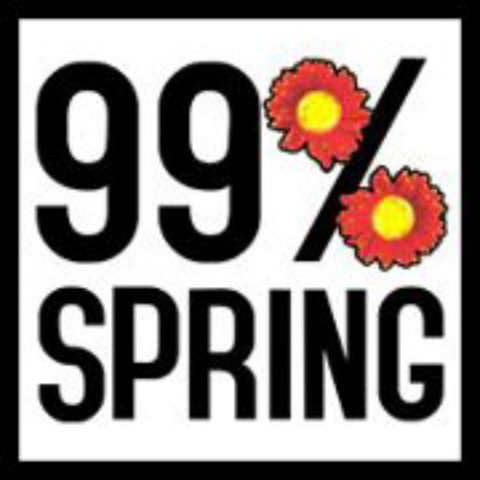 The 99% Spring is about training activists in how non-violent direct action can be used to fight for fairness for the 99%. Elections are not discussed in our training program and the trainings are explicitly non-electoral in nature. Some of the groups organizing the 99% Spring also do elections work (though the 99% Spring is not part of that work), while other groups organizing the 99% Spring are never involved in elections. N Anyone can sign up to host a 99% Spring training, and as such there’s no absolute way for us to prevent a trainer from ignoring us, but we instruct all trainers to leave any element of electoral politics out of the trainings. Q. How does this relate to Occupy? 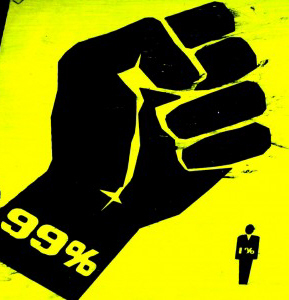 Will the 99% Spring detract from Occupy actions planned this spring? The Occupy movement is one of the things that inspired the 99% Spring, as did other recent non-violent direct actions, including last year’s demonstrations inside the Wisconsin state capitol and the Keystone XL tar sands sit-in in front of the White House. Many Occupiers led and participated in 99% Spring trainings. 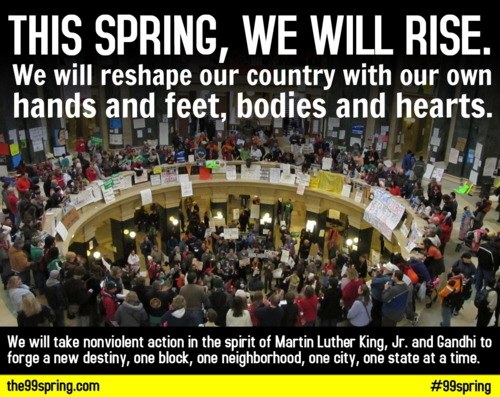 By introducing thousands of activists to non-violent direct action, the 99% Spring is increasing the pool of people who will be prepared and inspired to join various actions, including Occupy actions. The bulk of our in-person trainings were April 9-April 15 several weeks before Occupy-associated actions planned for May. 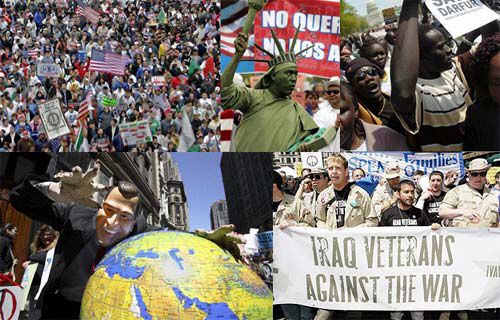 Anyone can list any nonviolent action, Occupy-associated or otherwise, on our Actions Map. This includes organizers of May Day actions and mobilizations — several such actions have already been added to the map. 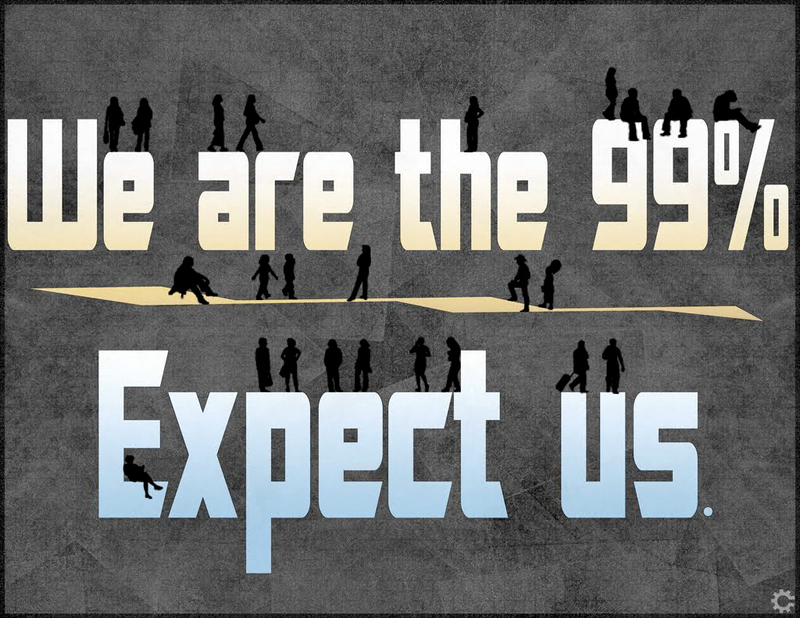 The 99% Spring website provides three campaign tool-kits that are full of resources to help you plan a local action! These are well-written and short enough to enjoy. Note that the PDF files are very large. For convenience, I have uploaded them here. 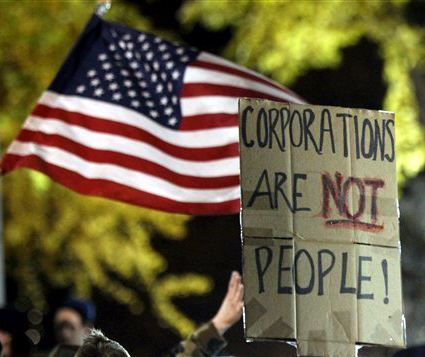 Send Wall Street, Corporations and the 1% the Bill on Tax Day April 17th! Bring the 99% to Corporate Shareholder Meetings: Hold Corporations, CEOs and board members accountable! 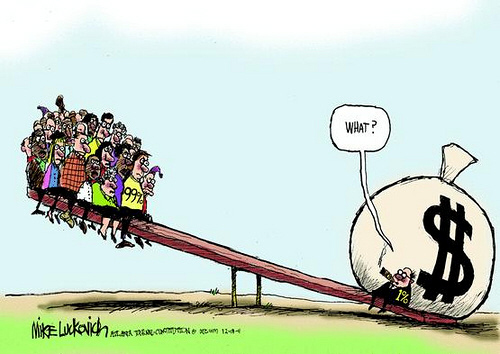 We will have to fully expose who is perpetuating wealth inequality and the status quo. That is why following the 99 % Spring, thousands upon thousands will be engaging in non-violent direct action to shine a light on the exact corporate actors who created this historically unjust economy. 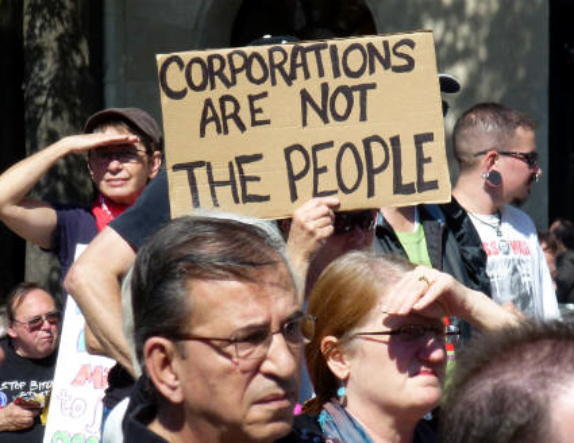 Under the banner of 99 % Power, there will be more demonstrations leading up to and at corporate shareholder meetings this Spring than at any point in American history. In this moment, we are called, like our predecessors, to act in ways that demonstrate the moral clarity of our purpose. Whether it’s been women risking arrest in the fight for the right to vote, African-American’s organizing lunch counter sit-ins and freedom rides to end segregation, or immigrants marching in record numbers in 2006 to stand down anti-immigrant legislation, there have been moments where we have expanded our participation in political life to end gross injustice. Conviction without action is impotence. The question that many of us will ask ourselves in 5 years, 10 years, 20 years is this: When it was clear we were deep down the path toward untenable economic and political inequality, did our action match the power of our convictions? This 99 % Spring, we will prepare ourselves to ensure we have a good answer to that question. We hope you will join us. Over the past several weeks, a broad coalition of progressive organizations—including National People’s Action (NPA), ColorOfChange, the National Domestic Workers Alliance (NDWA), MoveOn.org, the New Bottom Line, environmental groups like Greenpeace and 350.org, and major unions such as SEIU and the United Auto Workers—has undertaken a far-reaching effort to train tens of thousands of people in nonviolent direct action. They have called the campaign the 99% Spring. Starting this week, many of these same groups will be rallying their members and supporters to use newly honed skills to confront the shareholder meetings of corporations across the United States—charging executives with abusing workers, the environment, and communities in pursuit of profits for the 1 percent. They are calling the drive 99% Power. With prominent actions gearing up this week—starting with major protests at Wells Fargo meetings in San Francisco—the campaign may soon be coming to a city near you. The groups envisioned bringing together organizations to work across single-issue lines, using more confrontational strategies. For the fall, they planned overlapping weeks of action in eight major cities—which resulted in arrests from Boston to Los Angeles of activists demanding accountability for the big banks and protesting foreclosures. Since the Occupy Wall Street encampment in Zuccotti Park exploded into a nationwide phenomenon at the same time, these protests were largely covered in the media as part of the Occupy movement. Participants from the Occupy encampments joined in the demonstrations, and actions that had been organized by community groups, in turn, helped to create a sense of national scope and escalating drama for the movement. As the 99% Spring trainings neared, they attracted some controversy. Significant debate arose about whether the drive was an attempt by established organizations to co-opt the Occupy movement. In particular, the involvement of MoveOn.org, which some occupiers consider part of the mainstream political establishment, drew fire from more radical activists. 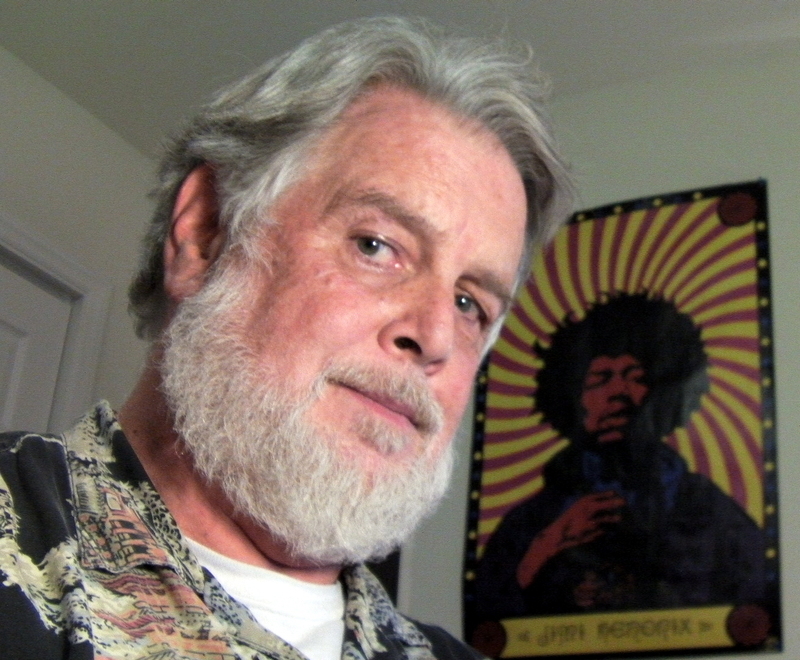 The magazine Adbusters warned that the trainings were an attempt to “neutralize our insurgency with an insidious campaign of donor money and cooptation,” and that the goal of the effort was to “turn our struggle into a… reelection campaign for President Obama.” Occupy Oakland activist Mike King similarly charged that the true motivation of the campaign was to neuter the movement and divert it into electoral efforts. “We should not have our tactics determined by the Democratic Party,” he wrote. Since Occupy Wall Street emerged last September, debates over its impact have roiled both liberals and conservatives confused by the fact of a (successful yet) leaderless movement lacking concrete demands. … The simple fact that the cream of the liberal-left establishment is promoting direct action trainings in the six-months before a presidential election rather than focusing all its energies on the electoral horse race is dramatic testimony to Occupy’s impact. After the trainings, a series of actions—referred to as “Shareholder’s Spring”—are planned to disrupt the shareholder meetings of Bank of America, Wells Fargo, Exxon Mobil, Chevron and thirty or so other leading multinationals along with a series of student-lead actions against Sallie Mae and other corporations that have profited off the student debt crisis. A cross-section of the country — from carpenters and stay-at-home moms to business people, students and farmers —signed up for hundreds of sessions organized by more than 60 activist groups and the nation’s largest unions. 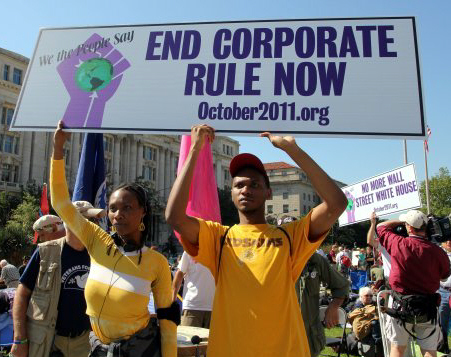 A key issue is the power of corporations over working-class Americans, said Goehl, whose Chicago-based National People’s Action represents a network of grassroots groups. Forty companies will be targeted, with protesters showing up and trying to block annual shareholder meetings. The biggest such action is planned for the Bank of America meeting in Charlotte, N.C., a month before the Democratic National Convention starts there. Larry Cohen, president of the Communications Workers of America, says his union will train at least 2,000 members to emulate the nonviolent methods of U.S. farm worker and civil rights activist Cesar Chavez and Indian independence leader Mohandas Gandhi. He said American workers have lost much of their bargaining rights — a problem first highlighted last year in Wisconsin, where tens of thousands of workers demonstrated against proposed legislation to limit collective bargaining. “We have to be in the streets, not only at the ballot box,” said Cohen, the Washington-based labor leader whose union represents about 700,000 workers. 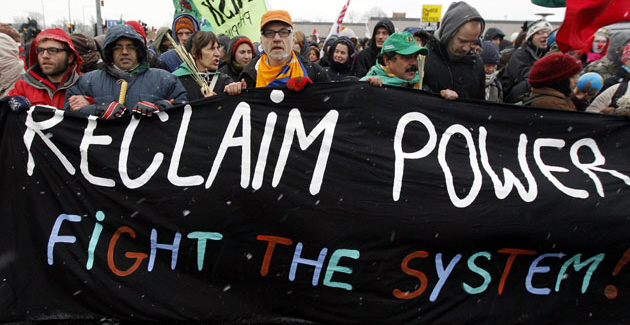 Joy Cushman, an organizer and trainer from the New Organizing Institute, insists that the intention of the project is not to compete with the Occupy movement. Rather, it’s a framework so that existing organizations can incorporate direct action into the work they’re already doing and capture some of the Occupy spirit. “The hope is that if people are not directly connected to campaigns, they will be able to take action locally for what is affecting them,” she told me. What is now The 99% Spring actually began last summer. Inspired by the Madison Capitol protests and the Tar Sands actions, leadership from Jobs with Justice, National People’s Action and the National Domestic Workers Alliance realized that the 2012 election year needed to be about issues, not the candidates. But OWS is about more than just direct action. Its emphasis on horizontalism and decentralization is at the heart of its approach to achieving social change as well. The OWS General Assembly’s “Statement of Autonomy” warns, “Any organization is welcome to support us with the knowledge that doing so will mean questioning your own institutional frameworks of work and hierarchy and integrating our principles into your modes of action.” It’s not clear to what extent organizers of The 99% Spring intend to do this. It may end up happening just by default, because so many people have been involved in Occupy encampments over the past few months, participating in Occupy culture. The 99% Spring was organized by a broad array of progressive groups to train thousands of participants in direct-action tactics. The most active groups include the UAW, Jobs With Justice, MoveOn, National People’s Action, Greenpeace and the National Domestic Workers Alliance. Dozens of other organizations have proclaimed their support too. Signatories include representatives from the direct action-devotees of the Ruckus Society to progressive establishment bedrocks like the National Education Association. This is unusual. The larger unions, not to mention MoveOn, generally do not devote their time, funds and energy to non-electoral strategy, particularly in a presidential election year. The very fact that the 99% Spring is as much their work as it is, say, National People’s Action’s is unusual, if not unprecedented, in recent years. Reports suggest the 99% Spring should not be condemned based on one dud training. As you might expect with any endeavor on this scale, the quality of the trainings, and their outcomes, will vary. While my subdued Fort Washington experience could only loosely be described as training, others did go through with the full instruction course. The Saturday training in downtown Philadelphia, for instance, put attendees through a full day’s training, while maintaining a sizeable crowd throughout. A minority of training sessions even resulted in immediate direct actions. Following a Michigan Organizing Project and Alliance for Immigrants’ Rights training, 200 attendees marched against the Mastronardi Fruit packing plant, a Trader Joe’s supplier, to demand an end to wage theft and employer abuse at the facility. Iowa Citizens for Community Improvement organizers immediately bused training participants to the home of Wells Fargo Home Mortgage president, Michael Heid, where they protested his bank’s egregious behavior — on his lawn. 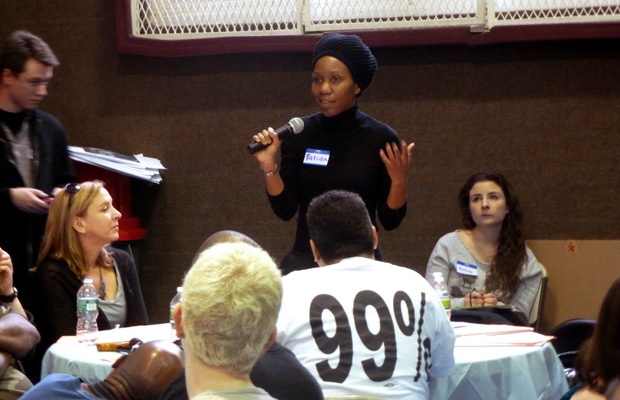 In New York City, a session led by Good Old Lower East Side (GOLES) and supported by MoveOn, trained 180 people. A hundred participants promptly formed an action targeting Bank of America’s New York headquarters, personally delivering letters of condemnation, telling their stories of abuse in front of the skyscraper, and demanding a meeting with the bank’s chief operating officer, Thomas Montag (total compensation: more than $14 million). Charlie Lulay, who came to Sag Harbor all the way from Huntington wearing a t-shirt with the slogan “I can’t afford a lobbyist: Occupy,” said he believed the 99% Spring Movement is simply “a front group” for MoveOn.org, the liberal, non-profit political advocacy group. He said Occupiers feel the movement is now riding on the tailcoats of the headway they’ve created in the push to reform current U.S. policy. The kerfuffle between the two protest factions began in large part because of overlapping schedules; the 99% Spring movement had planed to meet from noon to 7 p.m. during regularly scheduled Occupy hours. According to some Occupiers, they were not asked to share that space and time, but were rather told the 99% Spring would be there at that time. And thus, the Spring organization altered its plans. Of the estimated 100 people who were expected to show up for the training at the windmill, Clarjen-Arconada said all of them instead went to scattered locations across the East End (mostly churches and homes) where different training sessions were conducted. I get the desire for ethical purity in a progressive movement. But I’d argue that ethical purity is what resulted in the Occupy movement winding up as nothing more than a late-winter scuffle over the right to post tents in public spaces. You can’t win a battle if you’re picking fights with every side, as Ron Paul fans are learning right now. I think if Occupy wants to make a difference, they’d do better by supporting Barack Obama at the top of the ticket and also promoting a slate of more progressive politicians in local races. They also need strong leadership that understands the importance of compromise while still keeping the core message pure. The early days of Occupy were an inarguable success. Occupy got the message out to the masses. Economic injustice is now a major issue. But seizing banks and camping in downtown squares is a first, attention-getting step. That kind of behavior isn’t going to make a difference in the long run, and failing to support a candidate because he’s imperfect is frankly stupid. It’s better to get behind that candidate and make sure he knows he owes you once he wins. That’s how politics works. “On September 17, we want to see 20,000 people flood into lower Manhattan, set up tents, kitchens, peaceful barricades and occupy Wall Street for a few months. Once there, we shall incessantly repeat one simple demand in a plurality of voices.” That one simple demand was never made, and Adbusters’ directives were rarely listened to. A day before New York authorities cleared protesters out of Zuccotti Park, the magazine suggested that protesters “declare victory” and leave on their own. The protesters themselves are wary of outside groups — “there’s a wariness and it’s on both sides and it’s part of the bargain,” said OWS organizer Max Berger — but that hasn’t stopped them from teaming up with union members and other groups for the May 1st actions themselves, which will involve a concert and rally at Union Square and demonstrations in the Financial District. 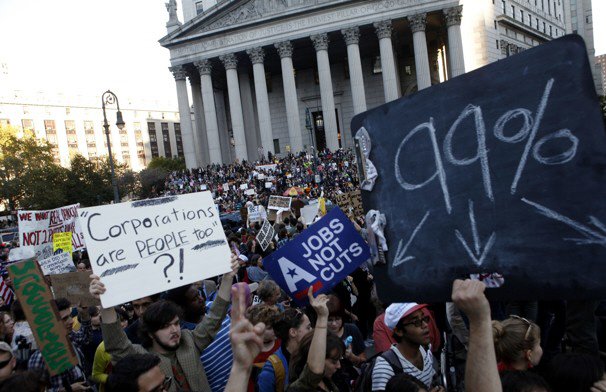 As the summer months approach, Occupy Wall Street is reemerging from its winter hibernation. But we shouldn’t expect the same beast. Tired of chaos, activists in Bremerton are re-organizing the movement to appear as tamer, wiser and more localized. “We’re going to figure out what to do instead of sit here with our feelings,” Jo Walter announced to the 20 or so people gathered inside Kitsap Unitarian Church on April 14. The group had sacrificed a sunny Saturday morning in favor of attending “The 99% Spring” non-violent action training and Walter, an Occupy Bremerton member, was facilitating the assembly. The attendees were eager to do just that. While the instructional video lectured on the origins of the Civil Rights Movement and called for ample self-reflection and role-play, the group clamored for the “meat and potatoes” of the meeting — the solution to this whole economic mess. Now, she planned on working from the background and making her preferences clear as a consumer. “As a citizen, we only have one vote, but we have a whole bunch of them in our wallet. Start voting with your money,” she instructed. “Go to Mom & Pop stores instead of the big chains. If we’re going to change the world, maybe we should change the neighborhood first,” Garrido said to approving nods. While tackling the national economic divide seemed impossible, the room had no shortage of ideas for local fixes. They included providing information resources to homeowners in danger of foreclosure, moving the county’s financial holdings to a local credit union and counteracting home-shattering deportations for frivolous traffic violations with Bremerton’s Immigrant Assistance Center. 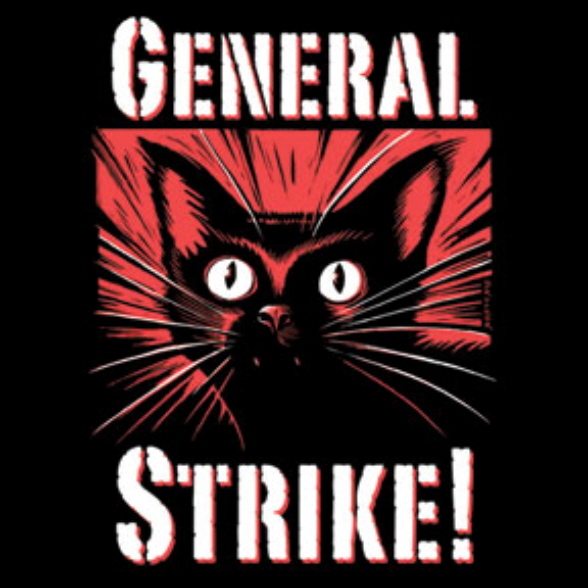 Kyli Rhoads, the youngest member of the training at 27, was the first to mention the May Day General Strike, Occupy’s biggest upcoming event this year. The movement asks all its members, here and internationally, to take a stand by walking out of work and school on May 1. The Seattle branch of the event hopes to dramatically “shut down the city” and asks it participants to generate a rebellious game plan. We’ve been telling you about The 99% Spring, the collective protest movement backed by Democratic Party activists and the labor movement. 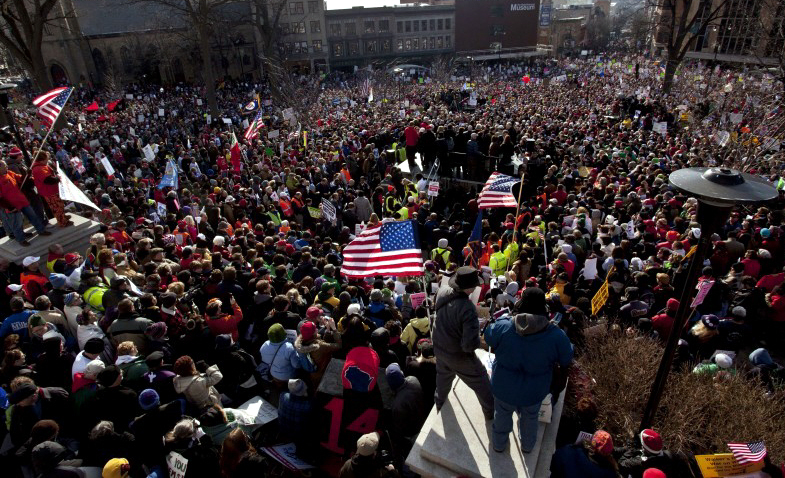 Earlier this month, The 99% Spring trained 100,000 protestors. And today, they took on their highest profile target: General Electric. Protestors massed outside GE’s annual shareholders meeting in Detroit (yes, it met in the Motor City). Several thousand people marched at the Renaissance Center, according to The Detroit News. Some made it into the meeting room, where they were escorted out by police. It was the second day that GE faced protests in Detroit. On Wednesday, protestors interrupted a speech by GE CEO Jeffrey Immelt at the Society of Automotive Engineers. GE tried to head off the headlines about the protests by making a jobs announcement. It said Tuesday it is adding 300 positions at an advanced manufacturing and engineering center in Van Buren Township, Mich. In his SAE speech, Immelt took issue with protestors’ accusations that GE is a tax dodge, saying the company paid a 29 percent corporate rate last year. But in retrospect, it probably was bad timing to hold a shareholders meeting in Detroit when a main backer of The 99% Spring is the United Automobile Workers union. Outside the annual meeting, protestors carried signs reading, “Fighting for Pension Fairness” and “COLA Increase – Affordable Health Care” referring to cost of living allowance increases. One protestor, Earl Hornung, told the News that he drove up from Indiana to show how he felt about his retirement situation. In a press release last week, The 99% Spring told of its plans to disrupt the GE meeting. “In particular, holding the meeting in Detroit—a city that has been dramatically impacted for the worse by the sort of tax dodging GE engages in—makes GE very much a target for the kind of disruptions we’ve seen at other shareholder meetings,” the organization said. In recent days, The 99% Spring protestors have disrupted or shut down several corporate shareholder meetings. The group claims its protests led to a shutdown at EQT Corp.’s meeting, prompted executives at Carnival Cruise Lines (NYSE: CCL) to cut its live broadcast and resulted in two hours of interruptions and ejections from the BNY Mellon meeting. Corporate America, get ready: The folks who brought you Occupy Wall Street last year may confront you at your next shareholder meeting. Activists with The 99% Spring coalition already have disrupted shareholder meetings this year at EQT Corp. (EQT), Carnival Cruise Lines (CCL) and BNY Mellon (BK). Now they’ve announced a full schedule of “non-violent direct action” at shareholder meetings, starting next week with Wells Fargo and General Electric and also including Seattle-based Amazon.com Inc. The coalition, which is composed of groups ranging from MoveOn.org to the Service Employees International Union , plans to block entry to the Wells Fargo (WFC) annual shareholder meeting in San Francisco April 24. What’s their beef with Wells Fargo? They want the bank to stop foreclosing on homeowners and pay more taxes — the bank’s effective tax rate has been low in recent years because of losses at its Wachovia acquisition. On May 1, protesters will hit three shareholder meetings: the Hershey Co. (HSY) in Hershey, Pa.; Great Plains Energy (GXY) in Kansas City; and Peabody Coal (BTU) in St. Louis. The Bank of America (BAC), Wellpoint (WLP), Pepco (POM), Amazon (AMZN), NextEra Energy (NEE), Comcast (CMCSA) and Walmart (WMT) also are on their hit list. If you have read this far, please learn more about this important issue by clicking here. Get high, hip and happy with your friends! !